they won't even notice the giblets are missing. And they can have all the turkey they want, promise. 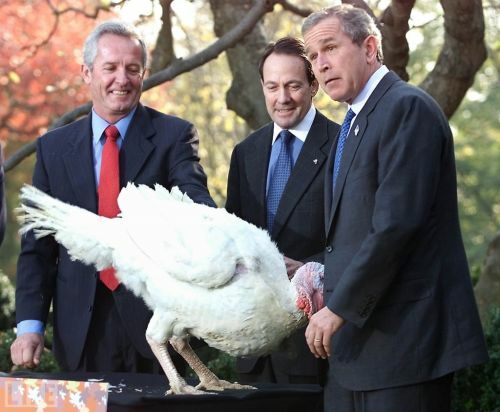 Is this your first Thanksgiving in the USofA? As a resident, yes. I've been to USA Thanksgiving before. much better. don't get ahead of yourself. What do you put in your stuffing (or dressing, if you prefer)? Cornbread is non-existent in Canada, so it was always white bread. I'm a fan of Stove Top, though. I made this Cranberry Fig sauce last night. It was super easy and it's really damn good. I did half the sugar and added some honey. This was probably why I transferred to another department. Last night, my Grandma's oven blew up. Just now, our garbage disposal clogged up. Happy Thanksgiving! HAPPY THANKSGIVING TO ALL YOU LOVABLE ASSHOLES!!! are you not a "conditional permanent resident" yet? FF - I'd love to get the recipe for that sauce. It sounds delicious! Nope not yet. I did my biometrics earlier this month and I am just waiting for the mail now. I used half of the recommended sugar and it was plenty sweet. ah I never work on fiancé visas. That whole process confuses me. FF - thank you! I'm excited to try this. Assuming I can still find figs, it seems like it'd be appropriate for Christmas too. edit: nevermind. I see it uses dry, not fresh figs. That looks pretty awesome. I am 100% looking forward to going to Denver this year for Thanksgiving and having copious amounts of Way's mom's twice-baked potatoes. And I'm making that Cranberry Fig sauce again. mmmmmm. My Thanksgiving plans fell through, so I'm currently drinking a beer and listening to Springsteen because USA USA USA. This is apparently a real ad. Pocyohotass is on the left.